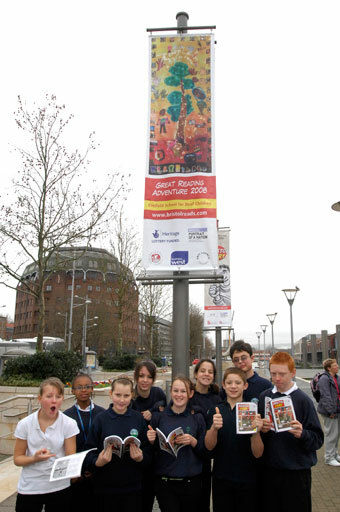 In this section you'll find news and pictures of events and activities that have taken place during the Great Reading Adventure in schools and colleges, libraries, businesses and the local community. We'll also post here pictures of readers of the book. If you have organised an event as part of this project, please send us details, along with any digital photos you might have taken, and we will include a selection here. Note that if young people are featured in your photos, full parental permission for their use must be granted before passing the images to us for display. See the Home page for announcements of events open to the public. Download official press releases from the box in the right hand column. "I think I can speak on Si's behalf as well when I say we had a splendid time during our signing session. Lots of people did come up, and several said how much they liked it. The highlight had to be this couple with two young children who they're home-schooling. They said they've only moved to Bristol recently and were delighted with the book as an introduction to the place and as something they've got the kids studying ... And they came to the Expo specifically to meet us! A mate from Bridgwater, who was there as a lifelong comics fan and artwork collector/dealer, made an interesting comment, too. He said it's interesting that Bristol Story has been "accepted" by fans of "proper comics" as well as by more conservative types who usually sneer at comics. So that's all good. If you're planning on buying us hats anytime, please note that the sizes have increased." 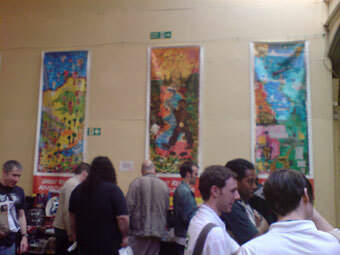 As you can see in Simon's photo below, some of the banners produced as part of Portrait of a Nation were on display during the event. The Comic Expo was visited by around 4,000 people and is being talked about as the best comic show in Europe. The Portrait of a Nation initiative, which brings together 17 cities across the United Kingdom in creative projects, was officially launched on 17 March. 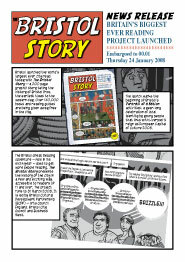 Bristol's own project has been running since November. 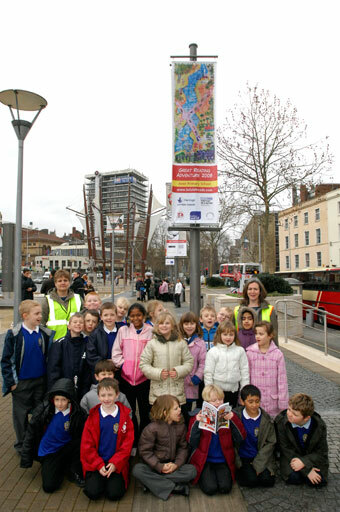 This is a series of workshops provided to schools and colleges in the city. 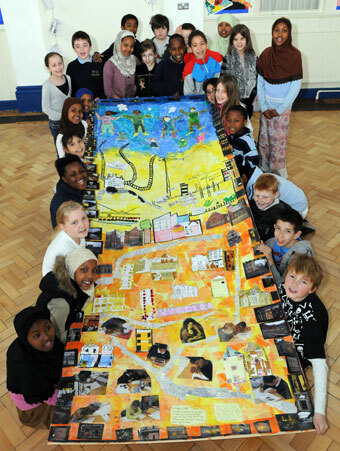 Shown here are the pupils of Hillfields Primary, Hannah More Primary, Colston's Girls' School and St George's Primary with the collages they have made about the city (photo credit: Martin Chainey). These will be transferred to durable material for display in Liverpool at the end of the year as part of the finale to the European Capital of Culture programme. 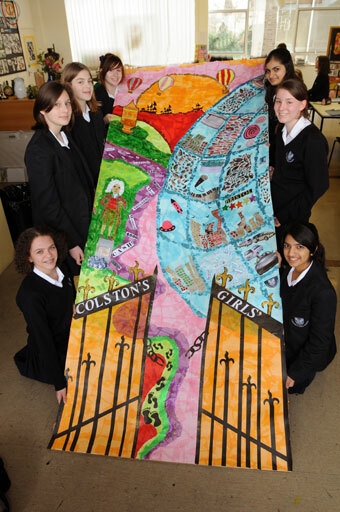 The banners from these four schools will also be on view in the city centre in Bristol in April and May. See the Portrait of a Nation page for further details. 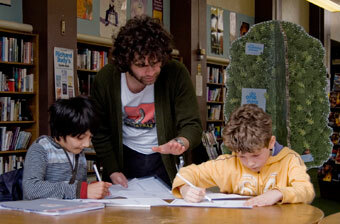 During the half-term holiday Simon Gurr, illustrator of The Bristol Story, ran workshops for children at four Bristol libraries on creating comic strips. These photos by Vicky Washington show the activities at Cheltenham Road on the morning of 20 February. 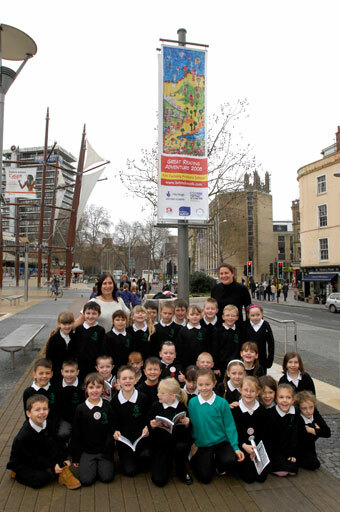 The 2008 Great Reading Adventure was officially launched in Bristol on 24 January 2008. Here are some of the photos taken on the day. 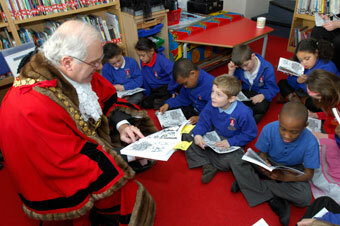 Councillor Royston Griffey, Lord Mayor of Bristol, reading The Bristol Story with pupils from St George's Primary (Martin Chainey). 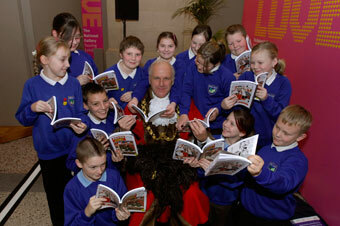 Cllr Griffey with pupils from New Oak Primary at the launch event in Bristol City Museum and Art Gallery (Martin Chainey). 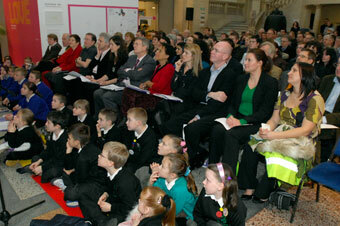 The audience at the launch event (Martin Chainey). Cllr Simon Cook, Neil Beddow (acta), Fiona Hamilton and Andrew Kelly (BCDP) read the opening section The Bristol Story (Martin Chainey). 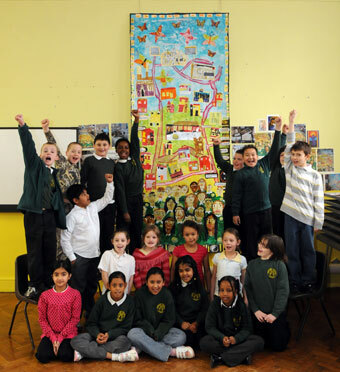 Pupils from Fair Furlong Primary perform their story about the unicorns of Bristol, written as part of the Portrait of a Nation project which is linked to the Great Reading Adventure. (Martin Chainey). You can read their story here (Word). 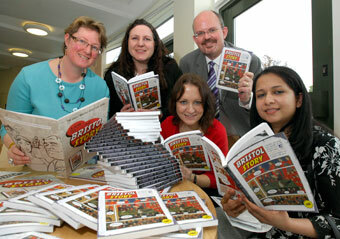 Staff at Callington Road Hospital in Brislington were among the first people in the city to start reading The Bristol Story. 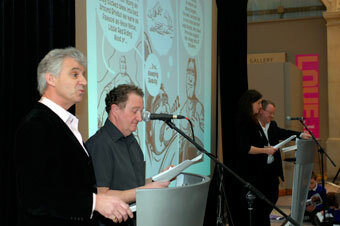 John Loy, Learning Resources Manager for the Avon & Wiltshire Mental Health Partnership NHS Trust, organised the event. Some of the 500 copies of The Bristol Story delivered to Callington Road Hospital a day before the official launch of the project (Martin Chainey). 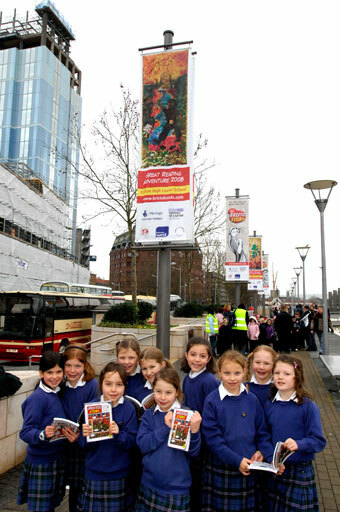 Students from four Bristol schools came to the city centre on Wednesday 23 January to see the banners they had created as part of the Great Reading Adventure/Portrait of a Nation project. 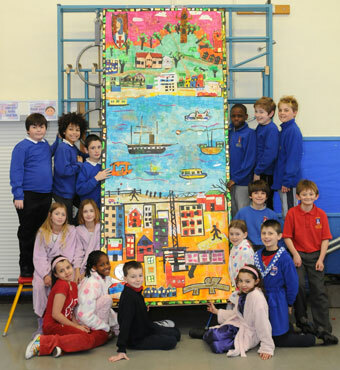 Banners made by other schools and colleges taking part in the initiative will be displayed in the city centre over the coming months and will eventually be exhibited in Liverpool as part of the finale celebrations for the European Capital of Culture programme. 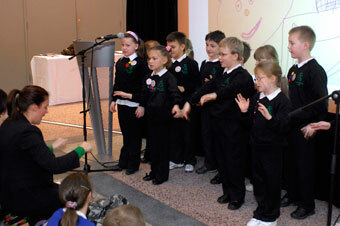 Elmfield School for Deaf Children (Martin Chainey). Fair Furlong Primary School (Martin Chainey). 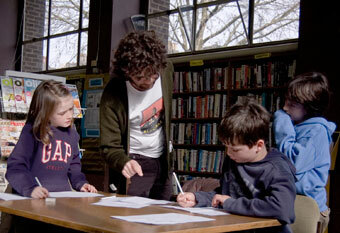 Avon Primary School (Martin Chainey). Clifton High Lower School (Martin Chainey). Who Has Made Bristol Famous?